At San Diego Comic-Con the cast of Star Wars: Rebels sat down to talk about the exciting new show from Clone Wars that will be premiering on Disney XD in the fall. Freddie Prinze Jr. ecstatically shared his enthusiasm for joining a world he's loved so much. He shared with press his joy at fulfilling a childhood dream, "It's something that anyone my age has gone through. I jumped off my roof when I was ten because I was certain the force would stop me. It didn't. I sprained my ankle-almost broke it. That's what kids did. It's STAR WARS!" Apparently the production was so hush-hush that the actor was mighty suspicious when he went into audition for a show named "Wolfpack". He expressed how, when he walked into the audition, he felt a disturbance in the force. "They didn't tell us it was Star Wars when we auditioned. It's a sci-fi show, they're talking about a sun sword and I'm like...sun sword? I thought they were ripping them off and then I walk in and see the character art. I walked in the room and I saw Dave (Filoni) with his Clone Wars Tsar grin. And I literally was like...is this....is this f**k**g Star Wars? And they all kind of grinned." The seasoned actor admitted that after years of doing auditions with no problem, he did indeed feel nerves that he was auditioning to be a part of a legacy that he had worshiped. "I sorta took a moment ...like, hold on... I just turned 8 years old. I gotta get some stuff outta my system." The role that Freddie Prinze Jr. has to fill is definitely a huge one. He is playing a Jedi named Kanan who's been living on the fringes since Order 66 was executed and everyone he had known and loved was lost. He's a character whose training was stunted at an early age and is actually quite different than the Jedi's we're all familiar with. Writer Simon Kinberg follows the mythology set before him but does break some rules with this new character, Prinze explained. "What they're doing with Kanan is risky. He's cocky, he's arrogant at times. That's not the Jedi way. Jedi are samurai, Sith are Ninja. The Samurai doesn't talk trash when he kills you, but this particular Jedi, order 66 took his master. I can't say who his master was but you find out very soon in the series." Speculation springs to mind the possibility that maybe Windu was his trainer. Mace Windu, of course known to be one of the Jedis who definitely treaded the line between sage and badass. So this lone wolf, more than a little rough around the edges, takes the new kid Ezra under his wing and begins to implement what he learned to be a master, even though he doesn't feel entirely ready. Prinze compares it to a father's instinct of protecting his cub. "When he's with Ezra, that's who Kanan is. He's deadly serious without thinking deadly thoughts. He is in that moment the Samurai. He is undisciplined to some degree but he pays for it every single time. He's forced to be a teacher." And as a real life father, Prinze is excited to share new stories with the next generation of Star Wars fans and even their parents who may get hit with nostalgia at seeing the new show. "Our contact point is the original. The show.. and not a lot of people know this... the guys who designed the shots and the lenses and everything-there is not a lens, a shot or an angle that's outside the original trilogy. So when you watch it and that feeling that a lot of people are saying they get (like watching the original ones) they're right! Its a trick that we're using to access that part of your brain and it works. It has an old school feel in a contemporary world. All those things combined." His excitement is palpable when he talked about how Rebels will be his own daughter's introduction to something he is a huge fan of. "My daughter is four and a half. She's gonna be watching this. She's already asking, "Dada when do I get to see it?" She loves Darth Vader. She saw him in the parade. She's like "Dada who's that?" I said it's Darth Vader. "Is that a bad guy, I said "Yeah, he's a bad guy. She looks at me and asked "Does he get to do whatever he wants?" and I literally had that parenting moment where I'm like, It's ME! I always liked the bad guys when I was a kid, I rooted for the bad guys in Pro Wrestling cause they always won. They only lost in the Pay-per view. If you wanted to see the good guy win, you had to pay Vince McMahon 50 bucks to see it. We didn't have 50 bucks. I pulled for bad guys. So I always liked Vader as a kid too, and she asked me this.. she says, "Does he get to do whatever he wants?" and I have to think fast and go, "No! He has a boss." and she goes "Who's his boss? ", I go, "The Emperor!" She goes, "Who's the emperor?" and I said "I am!" It worked I got to be the bad guy, she got to learn a lesson. She's old enough. I'm excited for that to be her contact point because it is so reminiscent of the original and can very quickly transfer her to those without Vader being super scary." 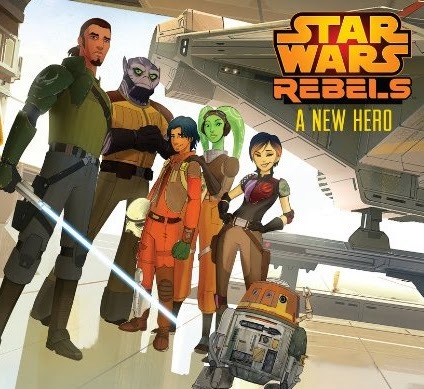 Star Wars: Rebels will air this fall on Disney XD. In the mean time, check out this clip from the show showing Kanan in action! Scheduled to premiere as a one-hour special telecast on Disney Channel, it will be followed by a series on Disney XD channels around the world.